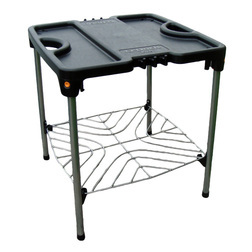 A lightweight, five stage setup, O-Grill portable gas cooking grill table for raising your O-Grill for standing use with large wire rack storage shelf and six utensil hooks. The Iroda O-Grill O-Dock Lite is a lightweight, five stage setup, O-Grill portable gas cooking grill table for raising your O-Grill for standing use with large wire rack storage shelf and six utensil hooks. With an easy and quick five stage setup the O-Grill cooking table can easily be built at your cooking location and will allow you to cook standing up, something that is usually more comfortable than cooking on the ground. The unique 'K-D' mechanism allows you to pop the legs into each table corner with ease and have a physical 'snap-into-place' slot so that you know the leg is in correctly. The legs can be released by depressing the leg tabs in to release the lock. Once the legs are in place the lower wire rack can be slotted into place providing strength to the lower part of the legs. Once locked in the table can support your O-Grill outdoor gas cooking grill. The table also features handy recessed locating sections for the O-Grill legs, preventing the O-Grill from sliding off the table. 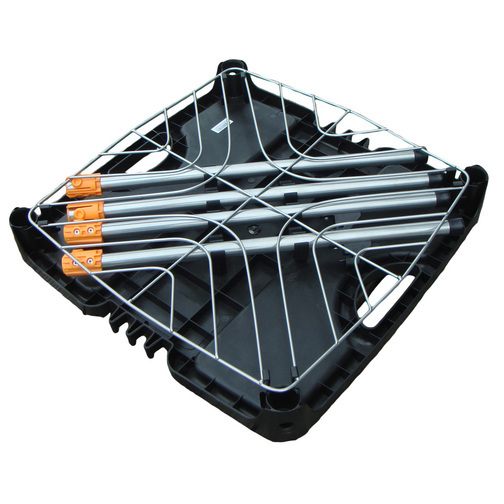 The six utensil hooks around the rim of the black plastic table top provide storage for your cooking utensils so they are easily to hand when you need them. Once you have finished cooking with the outdoor gas grill the table can be put away with all the elements clipped into place on the underside of the table top. The carry handle is large and well located for carrying back home or back on to the boat. The O-Dock Lite is compatible with both the O-Grill 500 and O-Grill 900T.